Primate Products is a South Florida-based corporation that imprisons, breeds, mutilates, and slaughters monkeys for profit. A key link in the global vivisection industry, this despicable company imports primates and then sells them, both living and dismembered, to U.S. labs for use in wasteful experiments. 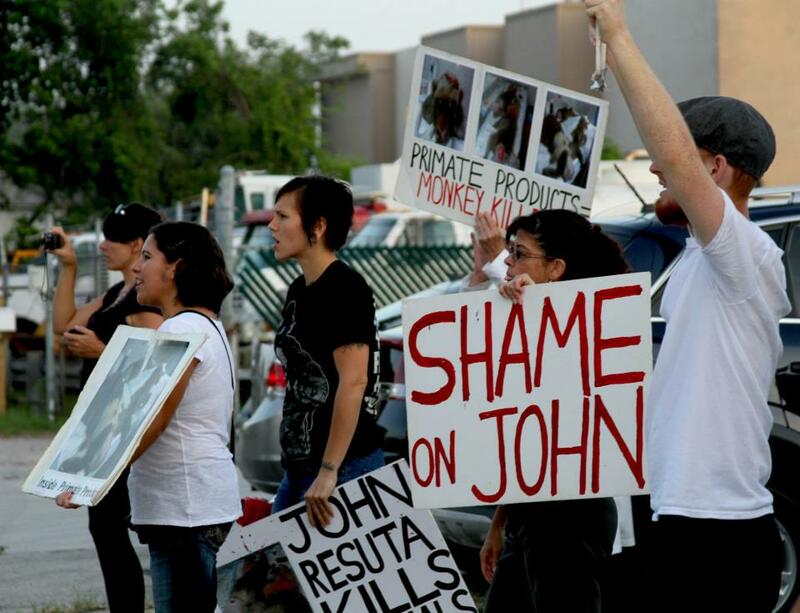 On Thursday, July 5th, we paid yet another visit to Primate Products’ quarantine facility in Doral—this time at 6:00AM. That morning, the monkey killers were likely reminiscing about the previous night’s festivities, while their primate victims awaited another day of agony and terror. As the workers arrived, groggy and presumably hungover (Couldn’t drive yourself, Janet? 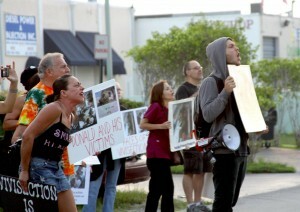 ), each was greeted by a swarm of 30 loud and impassioned activists. 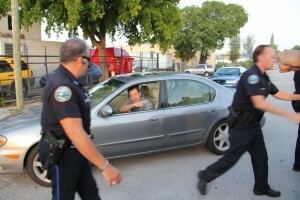 Also present were a dozen cops, with whom the animal abusers frantically pleaded to have us restrained. Even John Resuta, who almost invariably faces away from his accusers in pseudo-pride, broke his silent streak to whine to the police. (John alleged that a young protester committed the unspeakable, heinous act of touching his car window.) But we continued to exercise our First Amendment rights on behalf of the enslaved, filling the streets with our cries for justice and liberation. We reminded the murderers at Primate Products of our intent to keep coming back, day or night, till their sick company is shut down. What time will we show up next? I cant believe I missed this one…. Along with police, I believe PP should employ a 24/7 security/anti-terror force to guard the employees and premises with non-lethal weapons and tactics, but also armed. By Florida law, if any ARA touched his car if the window was down, grabbed the door, or even approached him threateningly; I see nothing legal to stop the victim from shooting the ARA according to “Stand Your Ground.” I’ll have to suggest this to PP. Myself… hypothetically, If I was approached with yelling and a sign, two hollow points would solve the problem. PEN, you make me VERY glad I don’t live in Florida. You are a sad specimen of humanity. I think you’re a troll. Enough said.